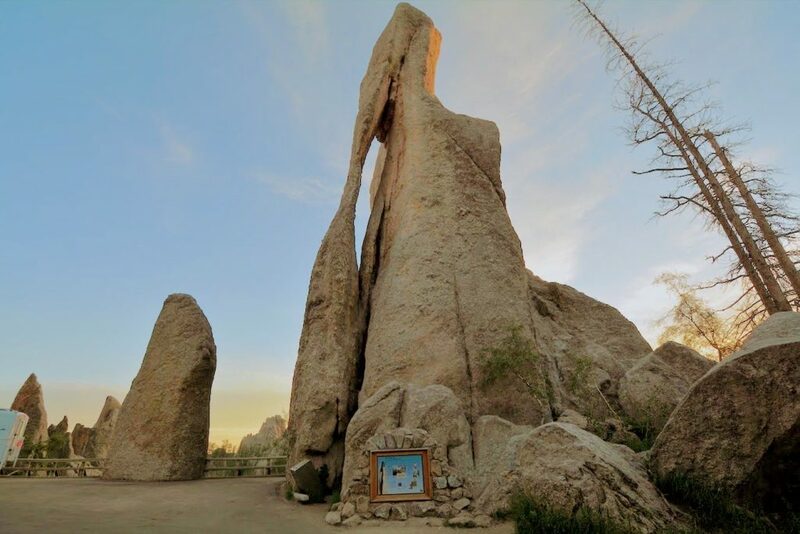 When we left off in our last post, we’d just arrived at the Needles Eye Tunnel after exploring The Cathedral Spires Trail. The Needles Eye is a dauntingly small, manmade tunnel, cut through granite cliffs. The tunnel provides automobile access between The Cathedral Spires Sylvan Lake. But the tunnel is small! We have no idea whether, or not, our Toyota Sequoia can pass through, unscathed. And, to boot, there’s a herd of mountain goats coming through it from the other side. One of the biggest advantages of traveling slow is, you can make time for the unexpected. In fact, you almost come to expect it! Today, the unexpected takes a couple of forms. First, this crazy tunnel is obviously too small for our big SUV to pass. But, before we can even get close enough to size it up, in earnest, here comes a herd of mountain goats! And when I say, “a herd,” I mean a herd! Easily a couple dozen goats of all ages. 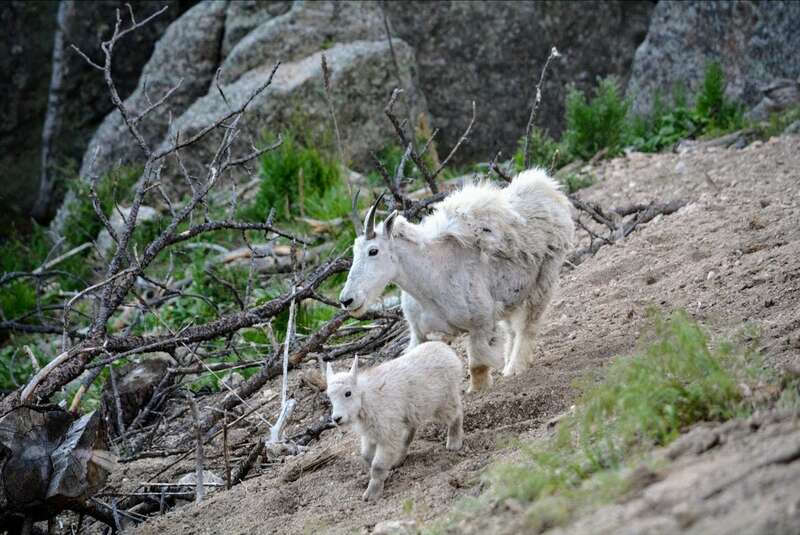 The Black Hills and Custer State Park provide all sorts of awesome wildlife encounters. A couple of days ago, we saw bison galore. Now this! Rule one for safe and exciting wildlife encounters is, “Don’t approach wildlife.” We can’t tell you how many times we saw this very (and other boneheaded forms of) behavior among tourists. Today was no different. 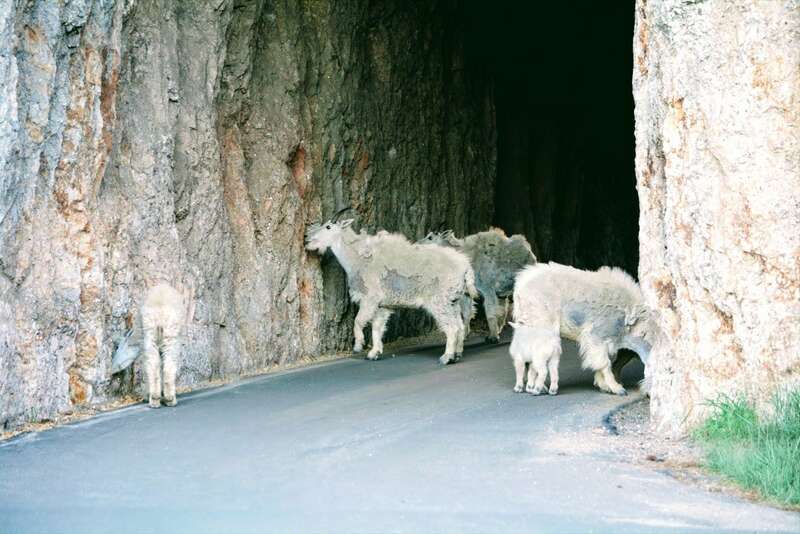 Cars stopped, about a dozen deep, on both sides of the tunnel to allow the goats their berth. However, this didn’t prevent folks from walking dangerously close to the goats to get that perfect shot. The mother and her young goat pictured above actually approached us, as they attempted to flee the madding crowds of encroaching tourists. The youngsters below (taken with telescoping zoom lens) wrestled like wild children for 10 minutes straight. They circled and spun, and butted and pushed each other, all while standing on an elevated, but flat rock surface. Craziest part of it was, there was a sheer 6 foot drop on all sides of the rock outcropping they were on. It didn’t phase them a bit. They just kept at it. Hard. 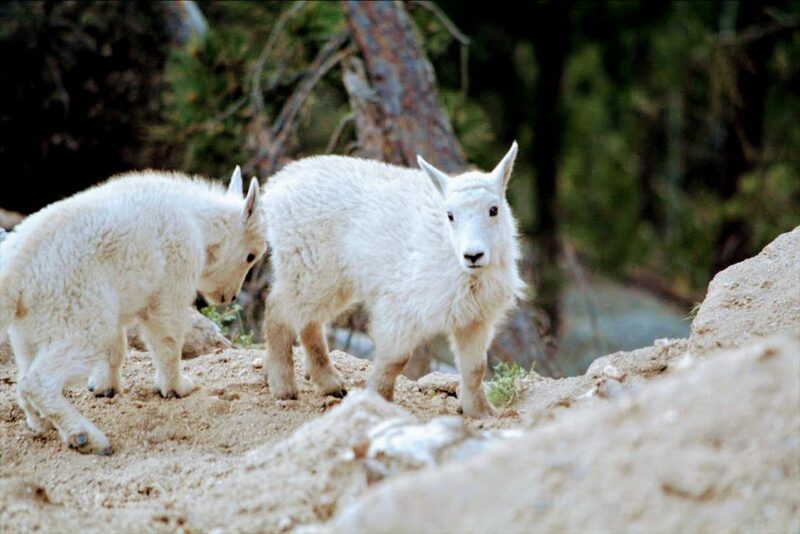 This pair of adolescent mountain goats were wrestling, hard, with 360 degree drop-offs. Amazing! There were so many goats! And they weren’t in much of a rush. A constant half dozen remained in the tunnel for the entire half-hour we waited. 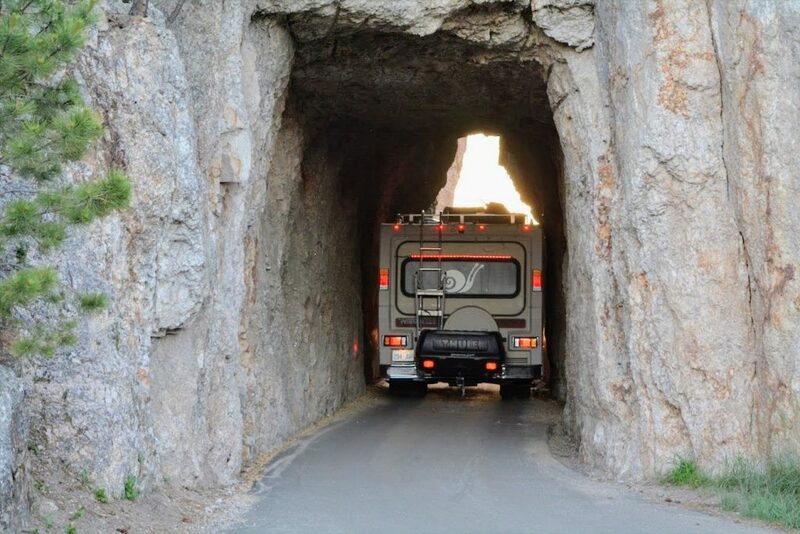 Eventually, a less patient (or less slow) fellow tourist decided that driving his Winnebago through the tunnel would be a good way to let those pesky creatures know they needed to get a move-on! Not, however, before scraping his vehicle several times along the claustrophobic granite walls. How would we fare with our Sequoia!? A Winnebago RV (audibly) scratches its way through the Needles Eye. What will happen to our Toyota Sequoia!? The tunnel was now clear of mountain goats. But we decided to hang back and enjoy the goat show for a little while longer. This also gave the line of waiting cars a chance to get move-on, themselves. Eventually, it was our turn. We’d seen pictures of tourbuses going through this thing, and we’d just witnessed a Winnebago do it). But that’s not to say the did so without scratching or denting. (We heard the Winnebago hit, with our own ears). But we couldn’t turn back. Daylight was burning. If we were going to have time enough to enjoy Sylvan Lake, we couldn’t take the long way round. We could only go forward! Turns out, the tunnel wasn’t as claustrophobic as we thought. And we passed through with room to spare. Not much to spare. But some. As big as our SUV seems, compared to regular sedans, it doesn’t come close to a Winnebago or a tour bus. Interesting thing about the Needles Eye tunnel. Its name seems an obvious choice based on the tunnel’s tight squeeze. But there’s another implication to the name. Just outside the west entrance of the tunnel stands the Eye of the Needle rock formation pictured above. Its just an amazing example of the beauty Mother Nature creates through wind and water wear. As always, we recommend taking a slow approach to enjoying your parks and recreation. You’re bound to see, feel, and experience more when you have a little time to enjoy a place. Custer State Park is no exception. 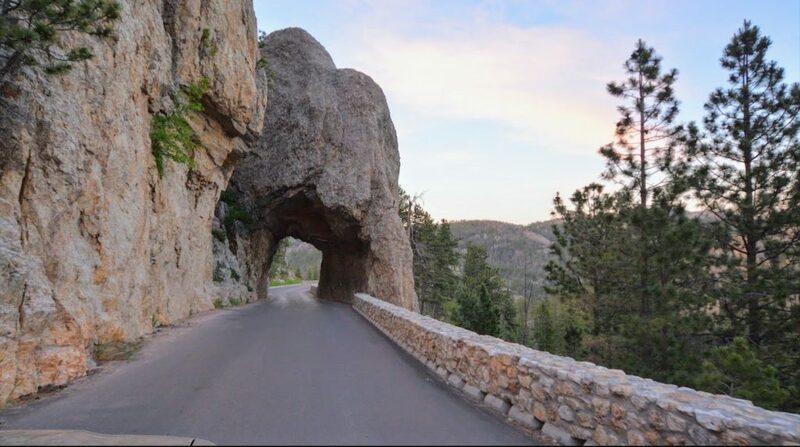 Needles Highway is part of the larger Peter Norbeck Scenic Byway, which you could easily spend multiple days exploring. 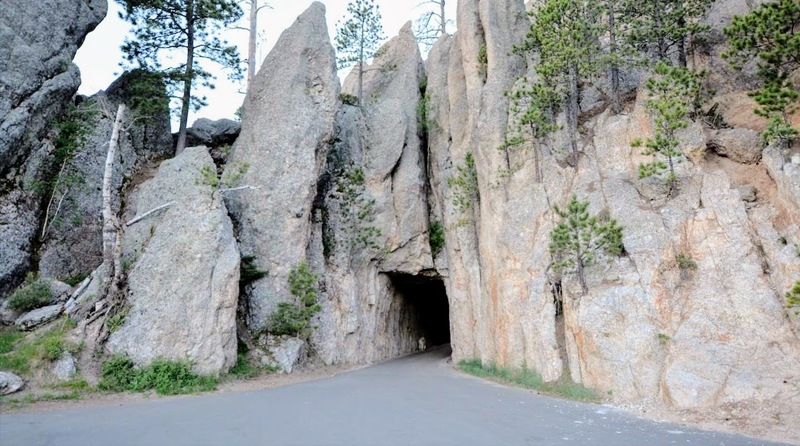 However, if you are pressed for time and you’re looking to combine a few choice spots in Custer State Park, for maximum enjoyment on a (time) budget, fear not. You can totally get this done. 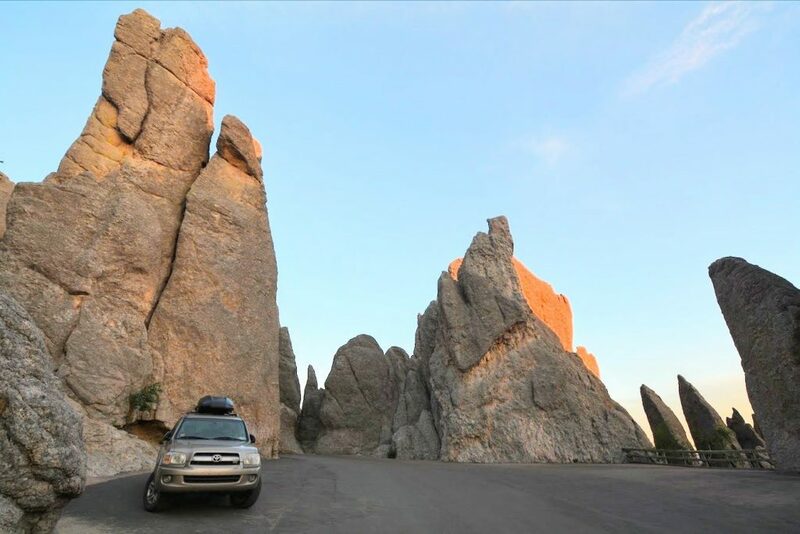 Within a single day (if you hustle, just a little), you’ll be able to swim for a few hours at Sylvan Lake, hike the Cathedral Spires Trail, and enjoy the drive along this section of the Needles Highway which connects to two. The best way to keep in touch with us is through our private email list. We send out a couple of communications per month. We share even deeper about our own journey, in an effort to add value to yours. To join us, just enter your email below. See you on the inside!